Need a replacement copy of your SSA-1099 or SSA-1042S, also known as a Benefit Statement? You can instantly download a printable copy of the tax form by logging in to or creating a free my Social Security account. What is a Social Security Benefit Statement? 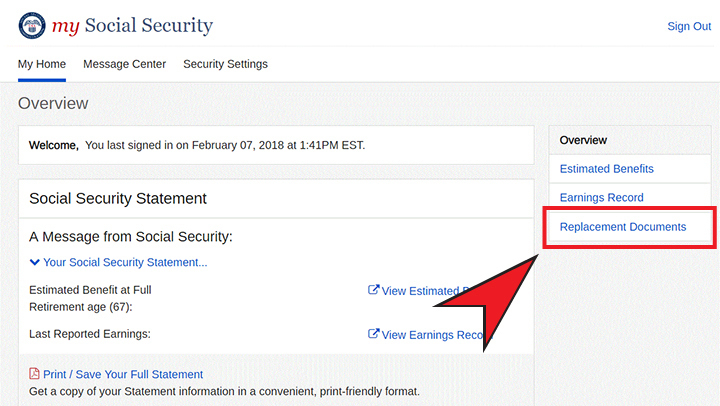 A Social Security 1099 or 1042S Benefit Statement, also called an SSA-1099 or SSA-1042S, is a tax form that shows the total amount of benefits you received from Social Security in the previous year. It is mailed out each January to people who receive benefits and tells you how much Social Security income to report to the IRS on your tax return. Noncitizens who live outside of the United States receive the SSA-1042S instead of the SSA-1099. The forms SSA-1099 and SSA-1042S are not available for people who receive Supplemental Security Income (SSI). A replacement SSA-1099 or SSA-1042S is typically available for the previous tax year after February 1. If you don’t have access to a printer, you can save the document on your computer or laptop and email it. Already have a my Social Security Account? Sign in to your account below and go to “Replacements Documents” to view, save and print your SSA-1099 or SSA-1042S. Don't have a my Social Security Account? Creating a free my Social Security account takes less than 10 minutes, lets you download your SSA-1099 or SSA-1042S and gives you access to many other online services. If you have questions or need help understanding how to request your replacement SSA-1099 or SSA-1042S online, call our toll-free number at 1-800-772-1213 or visit your Social Security office. If you are deaf or hard of hearing, call our toll-free TTY number, 1-800-325-0778, between 7 a.m. and 7 p.m. Monday through Friday.